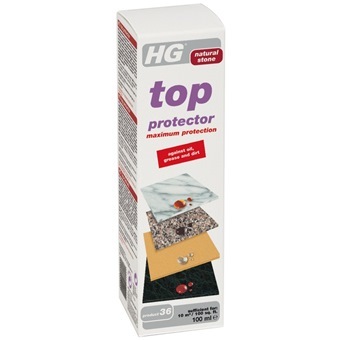 HG TOP PROTECTOR 100ML - HG272 is rated 4.0 out of 5 by 1. HG top protector (Product 36) forms an absolutely colourless, invisible protection for marble, limestone, sandstone, granite etc. It protects against (food) oils, vegetable and animal fats and other types of soiling. Without this protection from HG top protector, the soiling can penetrate deep into the pores of the material, where it can cause stains which will prove difficult or even impossible to remove. 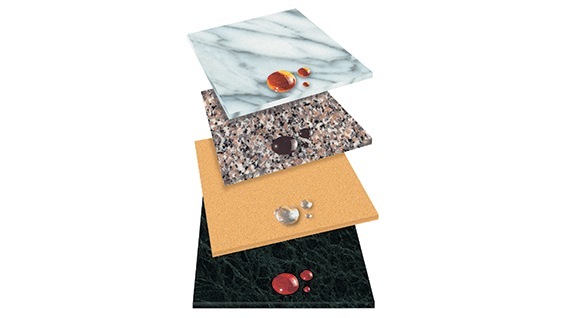 HG top protector can be used on kitchen floors, tabletops, worktops, mantelpieces, stone garden furniture and ornaments etc. etc. For the best protection against moisture in the bathroom and kitchen, we recommend marble is treated beforehand using HG marmer protector. The surface to be treated must always be clean and dry. Apply HG top protector very sparingly indeed using the supplied, non-fluffy cloth and rub in well into the entire surface for 30 seconds. In the case of very porous materials such as sandstone for example, HG top protector must be applied with a brush. 100 ml is sufficient for 10m². Rated 4 out of 5 by Share818 from Great product Bought and used it. Helps to protect the table top.